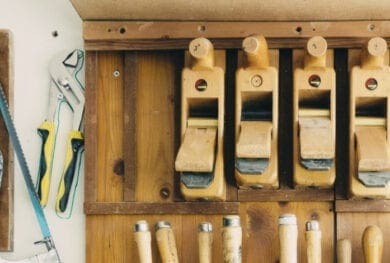 Home » ESG Investing: What Is It and Will It Give Me Better Returns? ESG Investing: What Is It and Will It Give Me Better Returns? This article was first featured on Insights, Standard Chartered’s external thought leadership hub. Socially conscious investing is becoming a more widely accepted practice as investors look for more than just profit. Companies are becoming increasingly aware of their environmental, social and governance (ESG) footprint, while growing numbers of investors consider ‘sustainability’ a crucial part of their portfolio. As more and more companies work to improve their ESG practices – which can include areas such as promoting energy efficiency and focusing on community contributions – there is rising evidence to suggest that investors who apply ESG criteria to their investment allocation could see significant benefits, regardless of whether their goal is to ‘impact’ invest or simply end up with better returns. ESG investing involves applying a set of agreed criteria to select companies that uphold ESG standards. Examples of common criteria include those agreed at the UN Global Compact (the UN Principles for Responsible Investing) and the Sustainability Accounting and Standards Board. ‘Sustainability’ as an investment approach now has a weight of research behind it. The study From the Stockholder to the Stakeholder, by Arabesque Partners and the University of Oxford, suggests that more than 20 per cent of global assets are now managed in a “sustainable and responsible” way. Moreover, awareness of ESG issues has grown considerably, as evidenced by the rising use of ESG data. The trend is not just a phenomenon for institutional investors alone: a 2015 study by Campden Research found that almost 60 per cent of ultra-high-net-worth families considered impact investing as a distinct asset class. However, there is clearly room for investor awareness to rise further. Our survey on sustainable investing trends noted that a “lack of information” was the main barrier against adding more investments in ESG strategies, while the perception of lower returns versus regular investment strategies appears to be a second hurdle. Why invest using ESG criteria? The reasons for adopting a ‘sustainable’ investment approach can vary, and are not just performance oriented. Some investors see it as a way to enhance investment returns; for others, it’s an approach that is consistent with their values or beliefs. For example, an investor may choose to avoid investments in alcohol, tobacco or gambling as they may find these socially objectionable. As we lay out in more detail below, we see ESG as a strategy that can: 1) help a portfolio outperform the broader market in select situations; and 2) reduce volatility. There are many ways to apply ESG criteria to an investment strategy. Initial ESG strategies tended to concentrate on an ‘exclusionary’ approach, in which the investible universe is screened with these criteria before applying any other decision-making processes. The main downside of this approach is blindly screening out potentially strong sources of investment performance. More nuanced approaches incorporate ESG as an additional factor within a broader decision-making process, or involve actively working with companies to improve their sustainability scores. The good news for investors who want to ensure their investments have a positive, sustainable impact, is that they can achieve this goal via ESG strategies without sacrificing investment returns. ESG investing may actually end up helping investors build a better investment allocation. Evidence suggests that incorporating sustainability factors leads to improved risk management, partly because ESG-compliant firms face lower costs of capital (i.e. a lower cost of borrowing in bond or equity markets) and a low risk premium due to greater transparency, and tend to face a lower risk of their assets becoming ‘stranded’ or worthless. For an ESG-focused investor, this means that even if returns with and without sustainable investing factors are similar, the same return may be obtained by taking less risk. 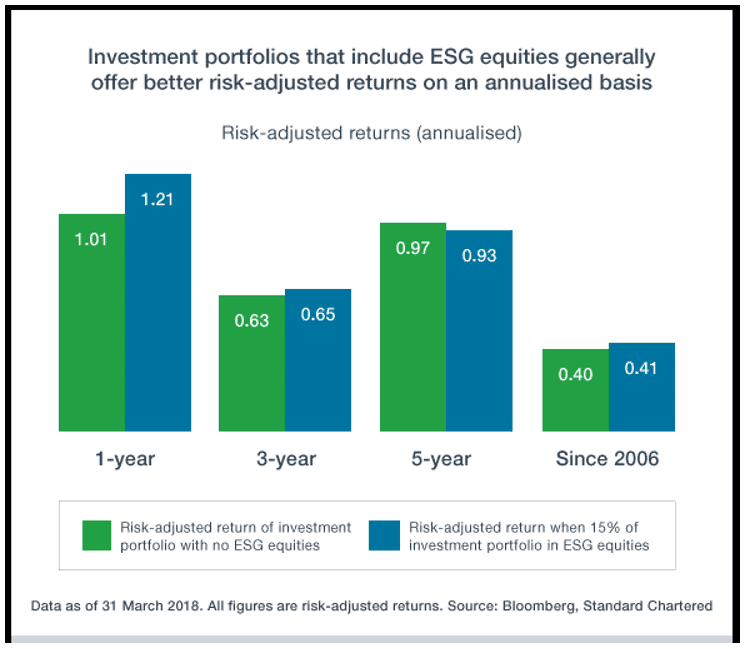 This point is illustrated in the chart [below], in which we show that investment allocations that include a small allocation to ESG equities offer better returns for the level of risk taken in most cases. The evidence on whether an ESG-based investment strategy leads to outperformance relative to a global equities benchmark is mixed. While a majority of studies argue there is a reasonably high chance that adding socially responsible investing criteria can lead to better investment returns over time, this is often sensitive to whether the ESG criteria are used to simply screen out investments that do not meet their conditions, or whether they are used as an additional factor as part of a broader investment process. Where the evidence appears more compelling is that incorporating ‘sustainability’ as a criterion appears to support improved corporate performance in specific parts of the market, such as bonds, real estate and emerging market equities. ESG investing does not come without risks, though. There is a suggestion, for example, that active exclusion of ‘sin’ sectors (such as alcohol and tobacco) can detract from performance over time. In addition, a greater share of the market trying to meet ESG criteria means it will become harder and harder for the approach to outperform. Nevertheless, on balance, we believe the positive characteristics of ESG investing outweigh the risks, and we expect it will be something that everyday investors increasingly demand. 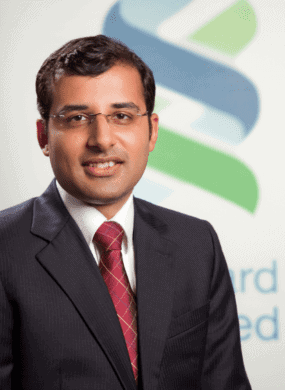 Manpreet Gill is Head of Fixed Income, Currencies & Commodities (FICC) Investment Strategy at Standard Chartered Bank. He is a key member of the Bank’s Group Investment Council and also acts as an advisor to the Discretionary Portfolio Management division. 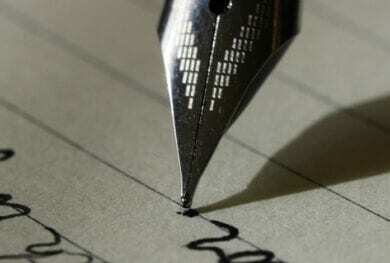 Manpreet’s views are widely sought by both clients and the media. He frequently appears on CNBC, Bloomberg as well as local TV stations across the region and regularly contributes articles to the region’s newspapers and magazines. While Manpreet is now based in Singapore, he has previously lived in a number of countries in Asia, Middle-East, Africa and Europe. He is an ardent motorsport fan.